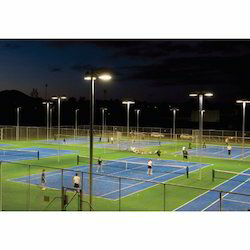 Offering you a complete choice of products which include flood light for tennis court. Our organization is successfully expanding its business in the market by offering quality assured array of Flood Light for Tennis Court. They are often used to illuminate outdoor play fields during twilight and night. These are the artificial lights that have high intensity. Our offered range is manufactured utilizing superior quality raw materials and prevailing high-end techniques. In tune with global set standards, the entire gamut is available in very nominal rates.